ABUJA—SEVEN suspected kidnappers terrorising commuters along Abuja-Kaduna Highway were paraded, yesterday, by the Nigeria Police after their arrest last week. SUSPECTED ABUJA-KADUNA HIGHWAY KIDNAPPERS: Ibrahim Gurgu, Abdulazeez Idris, Shuaibu Ibrahim, alias Kadi; Ibrahim Isiyaku, Usman Datti, Kabiru Musa and Haruna Umar, paraded by Police at Force Headquarters, yesterday. Photo: Gbemiga Olamikan. Their arrest, according to Force Headquarters, was effected by the Police Special Force, led by the Intelligence Response Team between July 8 and 9. The team, which had acted based on available intelligence at its disposal, swooped on the kidnappers’ dens in Gwagwada, Kangimi and Katari villages in Kaduna State, where the suspects were arrested. Ibrahim Gurgu, a 45-year-old native of Gwagwada village in Kaduna, according to the Police, was the leader of the gang, which had Abdulazeez Idris, 40, from Kankara Local Government Area; Shuaibu Ibrahim, alias Kadi, 29-year-old native of Kangimi village; Ibrahim Isiyaku, 30, from Gwagwada village; and Usman Datti, 30, from Gwagwada, all from Kaduna State. Force Public Relations Officer, Jimoh Moshood, a Chief Superintendent of Police, who paraded the suspects before newsmen in Abuja, said items recovered from them included AK-47 rifle, two locally-made pistols, 30 rounds of live ammunition, one magazine, two military camouflage, three cutlasses and charms. 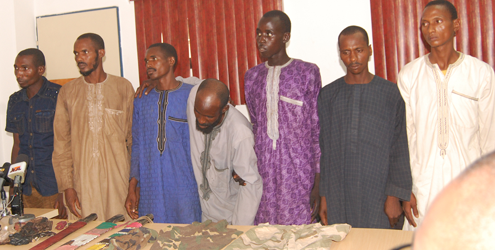 The post Police parade 7 suspects over Abuja, Kaduna Highway kidnaps appeared first on Vanguard News.